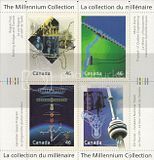 Canada Post had released "The Millennium Collection" a set of 68 stamps embedded in a specially made book. These stamps were not issued separately and also were not a part of that years programme. 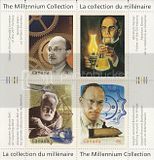 Subsequently citing "popular demand", they released these stamps as a series of 17 Millennium souvenir sheets, each depicting four different stamps, starting December 17, 1999 through to March 17, 2000. 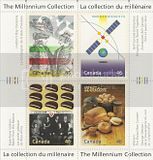 The Final Four, March's series of four Millennium Souvenir Sheets features among other, Bell Canada, Bombardier, the Canadian Space Program and McCain Foods. 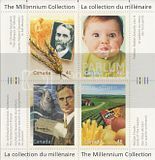 These bold 112 x 108 mm souvenir sheets frame four 36 x 48 mm stamps in thematic groupings that celebrate Canadian giants in fields as diverse as engineering, commerce and innovation. Back to The Millennium Collection: On with the show! Cool set of souvenir sheets! ...and very diverse subjects on the stamps. Thanks for showing them to us!